2. When oil is warm, add onions. Cover and cook for 5-10 minutes, stirring occasionally. 4. 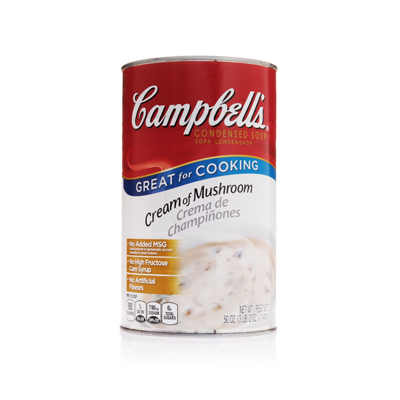 Add in Worcestershire sauce, water, and Campbells® Cream of Mushroom Condensed Soup. For heartier texture, add sauteed mushrooms to the finished sauce. Add a kick with hot sauce. Serve with chicken breast, over pasta, nachos, melts, turkey, oysters, pork, beef, and as a binder sauce for casseroles.